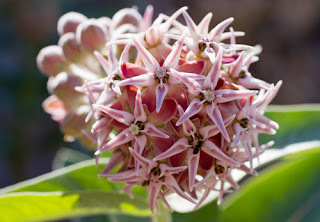 Asclepias speciosa Torr. or Showy milkweed is native to western North America and is part of a group of plants commonly and collectively known as milkweeds due to the milky sap in the stems and leaves. The etymology of the scientific name once again comes from Greek mythology with Linneaus naming the genus after the Greek god of healing Asclepius due to its many medicinal uses. The species epithet speciosa translates to beautiful or showy as in the common name, and never has a truer word been written, as this is a visually striking plant. Yet from a distance you may think nothing of it because in bud it can look quite nondescript, with greyish-green leaves and a hairy brownish head. But on closer inspection when in flower, you will find the most wondrously sculpted and intricately organised light-pink inflorescence. Each plant's head has numerous flowers forming what seems like a sphere, although in reality they are more like an umbrella, with all pedicels attached at the same place on the stem. 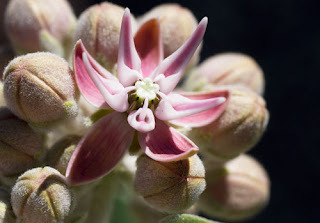 Each individual flower has five petals bent backwards with five stamens fused into a tube, each with an horn-like appendage (see image above) attached. Because of its rhizomatous growth habit, you will often find it growing in large clumps, making it even more spectacular in the wild. Once part of the Asclepiadaceae family since APGII it is now treated as a sub-family of Apocynaceae. The Catalogue of Life follows APGIII groupings at family level but to create a unified and simplified checklist across all kingdoms the rank of subfamily is not used. There is much more to know about this plant, its long history and variety of medicinal use as well as its close association with butterflies and other insects who rely on it, however today on Taxon of the Day we are superficially focusing on its good looks.